Associated Press Indiana's Nick Westbrook celebrates after scoring a touchdown against Virginia on Saturday in the Hoosiers' home opener. BLOOMINGTON – Indiana coach Tom Allen grew weary of all those close calls last season, so he challenged his team to find a finishing touch. 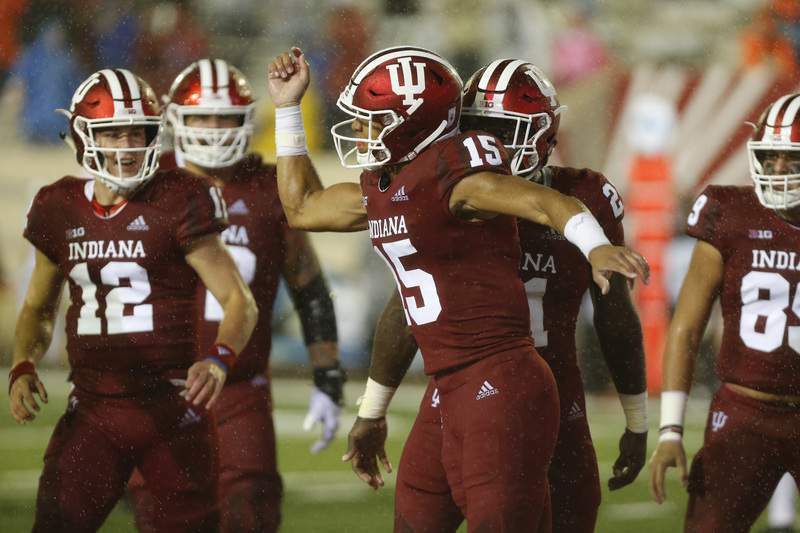 On Saturday, Allen witnessed the payoff when the Hoosiers overcame a scoreless second half, heavy rain and a late pass interference penalty to hang on for a 20-16 victory over Virginia that could prove crucial to their bowl hopes. It was exactly the kind of game the Hoosiers (2-0) had allowed to slip away in previous years. Allen vividly remembers last October's overtime loss to Michigan, the blown fourth-quarter leads the next two weeks against Michigan State and Maryland, and the fourth-quarter rally at Purdue, which fell short. Winning any of those games would have made Indiana bowl eligible. Instead, they went home before Christmas seeking solutions. Throughout the offseason, as the Hoosiers worked extensively on adding speed and getting stronger, Allen's one-word motto never changed: Finish. They needed it on a day inclement weather prevented either offense from doing much after a first-quarter scoring flurry, and Indiana's defense delivered in its first real test of the season. It appears Indiana may finally have a 1-2 knockout punch. With explosive receivers and an experienced quarterback in Peyton Ramsey, the Hoosiers certainly could continue scoring points by the dozens. And with Morgan Ellison suspended indefinitely and Cole Gest lost with a season-ending knee injury, 236-pound running back Stevie Scott could help ice more games behind a big, experienced offensive line. Scott rushed 31 times for 204 yards in his first college start, falling 4 yards short of breaking Anthony Thompson's 32-year-old single- game rushing record for true freshmen. On Monday, he shared the conference's Freshman of the Week award with Ohio State quarterback Tate Martell. Allen believes Scott's performance may only be a preview; Ball State comes to Bloomington on Saturday. Add a defense that grew up quickly between the first two games, and suddenly, the Hoosiers are playing the way Allen envisioned. They can score points. They can keep opponents out of the end zone. And now, it appears, they may finally have the final piece – a way to preserve late-game leads.